blessed life is the same: choose wisdom, follow God, and you’ll be blessed. In this book Andrew shares personal insights from the foundational principles, divine guidance, and sound counsel contained in the book of Proverbs. Get ahold of Andrew’s teaching on Proverbs for the timeless wisdom you need to live a life of blessing! This software package installs on your computer and provides an in-depth, verse-by-verse commentary. Godly wisdom never goes out of style. 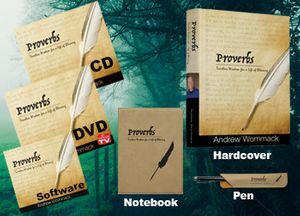 Get your Proverbs Package today, and get the timeless wisdom you need to live a life of blessing! commentary, this new teaching contains Andrew’s personal insights into the principles and sound counsel found in Solomon’s book of wisdom.